When adding child elements to a Canvas panel, you can specify at most two of the four attached properties: Top, Left, Bottom, Right. This places the child element relative to one of the four corners of the Canvas. Child elements can have values for their Margin property, but only two of the four possible sub-values are used. The two parts of the margin used are based on the two Canvas attached properties that are being used. For example, if you position a child element using the Canvas.Bottom and Canvas.Left properties, then only the Bottom and Left portions of the child element’s Margin are used. The Top and Right margins are ignored. 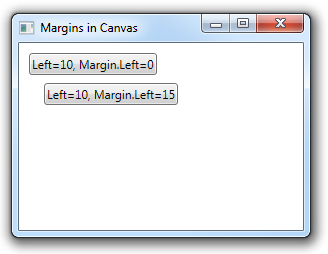 Margin values that are used are added to the canvas positioning properties.